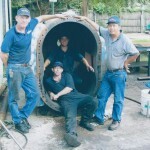 At Pat’s Pump & Blower, we offer O’Brien trailer jetter sales & repair for your commercial needs in Orlando, FL. O’Brien trailer jetters are a great resource for plumbing experts, since they provide high-power water pressure that can help to clear clogs in pipes, drains, and other plumbing. They are large enough that they must be mounted on a trailer, so if you plan to buy one of these machines, make sure you have a truck that can tow it to job sites. They have mounted polyethylene water tanks, and many of the jetters have sump and side baffles for maximum power. The size stabilizers and crowned tops provide additional strength, while the safety gauge has an automatic shutdown method to protect the pump from damage if there is a sudden decrease in water pressure. The trailers on O’Brien jetters are strong and durable, with axels rated at 6,000 pounds each, which means that drivers can tow them at freeway speeds with full tanks. Catwalk fenders make it easier to access the pumps and tanks and feature heavy-duty diesel engines to provide maximum power. At Pat’s Pump & Blower, we offer O’Brien trailer jetter sales & repair for your commercial needs. Our team has experience with all types of O’Brien trailer jetter sales & repair, so we can solve problems quickly. Our service area includes Orlando, Florida as well as some of the surrounding cities. We work with industrial and commercial clients for O’Brien trailer jetter sales & repair, so call us today for more information about how this type of equipment can help your plumbing business thrive.